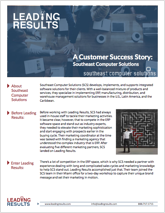 Southeast Computer Solutions (SCS) needed a partner with experience dealing with long and complicated sales cycles and marketing knowledge to help them stand out. Leading Results accomplished just that. The Leading Results team joined the SCS team in their Miami office for a two-day workshop to capture their unique brand message and set their marketing in motion. After the workshop, the Leading Results team laid out the blueprint for a new, balanced marketing strategy and a HubSpot- based web presence that fully integrated the plan and a new level of professionalism that sets SCS apart from their competitors. Fill out the form on this page to receive the download of the case study.